Just to dispose of some inattentive readers' attacks: Neo-Luddism is defined quite well. 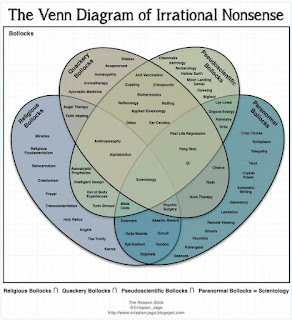 The above diagram (click to enlarge) includes a lot of known pseudo-sciences, superstitions, conspiracy theories etc. It mentions one of the most dangerous: the anti-vaxxers, the people who one of these days could be the undoing of us all, among many others. 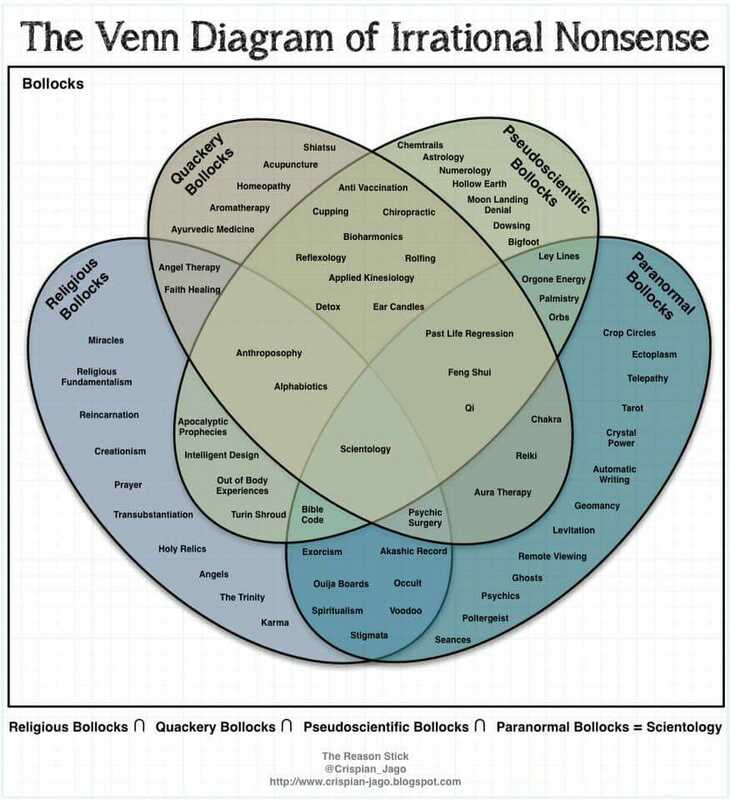 One addictive religious cult is missing from the list: the anti-GMO folks. Not many people these days dare to say something in favor of genetic modification of any living thing, be it a carrot or a human being. The snowball of so called public opinion made any defense of this scientific domain an unhealthy business. Not that the work in this field stopped (I hope it never will), but the level of histrionics in the public discourse on the subject is so high, that it doesn't allow defense to be heard. To state up front: I don't think that there isn't any potential danger in genetic engineering. Like many other sciences, it should be supervised, checked and rechecked. Thankfully, the institutions to do so are in place. In fact, the paranoid attitude of the above mentioned public made these institutions overbearing, increasing tenfold the time and effort in developing new products. Just as in the big pharma, where it takes about ten years and about half a billion dollars to develop a new drug. Of course, cases like the Nuedexta or, much worse, Thalidomide, will remain as painful reminders of the need for careful study and implementation of every new compound. But making it a cause for Luddites? And no, these two examples don't have anything to do with GMO products. So far there has been 0 (zero) cases of proven deaths by GMO foods. Dear GMO-haters: when you proudly stick your teeth into a certified non-GMO and (definitely) organic apple, brought to you courtesy of your certified organic non-GMO farmer (and paid for thrice as much as one would pay for a regular supermarket apple of same or better quality, of course), you should be aware of one thing. Your apple is a product of a long, probably hundreds of years long, chain of genetic engineering. And, for the purpose, I am disregarding the genetic engineering as it was (still is) done by the evolution of the apple trees. I am talking about the selective breeding, performed by uncounted generations of apple growers all over the apple growing world. If any one of you, dear neo-Luddites, thinks for a moment that you are partaking of the virginal proto-apple, as it was created by nature/higher being, perish the thought. You are chomping down on a perfect example of genetically engineered fruit - if not of molecular biology with its frightening tools, then of many years of our forefathers selecting the trees with genes* most suited to produce your perfect "non-GMO" apple. Which apple, while being genetically engineered, will definitely keep the doctor away**. In 2010, the European Commission published a detailed report on fifty research projects carried out between 2001 and 2010 through scientific grants from the European Union. 200 million euros were spent on these studies, they dealt with the impact of GMOs on the environment, the safety of GMO use in food, the use of GMOs as sources of biomaterials and biofuels and so on. 400 research groups participated in the project. The main conclusion of the report: "Biotechnologies and, in particular, GMOs do not carry greater risks than traditional technologies for breeding new varieties". The US, Russia and many other countries also financed the studies of GMOs from their budgets, concluding that these products are no more dangerous than conventional ones. But here comes another charlatan, this time from the field of biology. The Séralini affair was the controversy surrounding the publication, retraction, and republication of a journal article by French molecular biologist Gilles-Éric Séralini. First published by Food and Chemical Toxicology in September 2012, the article presented a two-year feeding study in rats, and reported an increase in tumors among rats fed genetically modified corn and the herbicide RoundUp. Scientists and regulatory agencies subsequently concluded that the study's design was flawed and its findings unsubstantiated. Following widespread criticism by scientists, Food and Chemical Toxicology retracted the paper in November 2013 after the authors refused to withdraw it. The editor-in-chief said that the article was retracted because its data were inconclusive and its conclusions unreliable. In June 2014 an amended version of the article was republished in Environmental Sciences Europe, and the raw data were made public. The journal did not conduct any further peer review; reviewers checked only that the scientific content of the paper had not changed. The press conference led to widespread negative media coverage for GM food, especially in Europe. Le Nouvel Observateur covered the press conference in a story called, "Yes, GMOs are poisons!". At the time of the initial release, French Prime Minister Jean-Marc Ayrault said that, if the results are confirmed, the government would press for a Europe-wide ban on the maize and The European Commission instructed the EFSA in Parma, Italy, to assess the study. In late September 2012, Russia temporarily suspended importing GM corn as a result of the study and in November 2012, Kenya banned all GM crops. As it can be, unfortunately, seen, it takes one politically motivated charlatan to undo the good work of thousands. These days European leaders not only prevent the entrance of genetically enhanced crops into Europe, they also sabotage introduction of such in Africa, in effect killing people. The saga of ludicrous accusations, false "discoveries" and dirty politics around GMO issue could continue indefinitely, but there are limits to a post's length. Suffice to add, that, strange as it is, the paranoid behavior of a good part of the public plays into the hands... of big corporations that produce GMO. What really happens is that the impossibly high thresholds, established for approval of GMO-based products reduce the number of competitors to those whose financial resources allow them to survive long enough to satisfy the necessary checks and controls. So Monsanto***, which you so love to hate, gets that much stronger when you help to eliminate the competition. According to the sociological survey published on the website of the Analytical Center of Yuri Levada, the question "Is it true that ordinary plants do not contain genes, and genetically modified plants - contain?" The correct answer "no" was given by only 29% of the respondents. By curious coincidence, the proportion of people who do not know the correct answer to the question about genes in tomatoes is roughly equal to the proportion of people who consider GMOs to be hazardous to health and subject to prohibition. This and other tidbits were picked up by yours truly from an excellent book Summa Biotechnologiae (Сумма биотехнологии) by Dr. Alexander Panchin. I hope the book will be translated soon enough. (**) The biotechnology companies are perfectly aware of the nature tinkering with genes of its own babies. To avoid the enforced necessity to mark their products as GMO, several companies do something different: they analyse the plants' DNA, select the seeds that carry the preferable traits and grow and sell the seeds, without introducing any man-made modifications. Clever? Yes. Of course, it limits the ability to add some desired qualities, but what can you do with a hostile market? (***) And no, Monsanto is not the biggest. Check this.